A wounded man is carried following an air strike on the rebel-held besieged town of Arbin, in the eastern Ghouta region on the outskirts of the capital Damascus on January 2, 2018. U.N. Human Rights Chief Zeid Ra'ad al-Hussein has condemned the recent escalation of fighting in Eastern Ghouta in Syria, causing scores of civilian deaths and injuries. The U.N. Human Rights office says 85 civilians, mostly women and children, have been killed and at least 183 injured in the besieged city of Eastern Ghouta, a suburb of the Syrian capital Damascus. 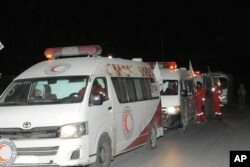 FILE - Photo released by the Syrian official news agency SANA, shows members of the Syrian Arab Red Crescent gathering near their ambulances during a human evacuation of sick and wounded people from the eastern Ghouta, near Damascus, Dec. 28, 2017. These mass casualties have occurred since December 31 over a 10-day period. The UN office blames them on an upsurge in airstrikes and ground-based attacks by Syrian Government forces and their allies. 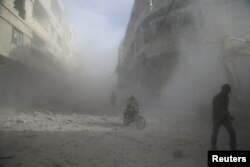 During this same period, it notes armed opposition groups inside Eastern Ghouta have fired rockets into residential areas in Damascus, causing great fear among the population. People are seen during shelling in the town of Hamoria, eastern Ghouta in Damascus, Syria, Dec. 3, 2017. In condemning these attacks, High Commissioner Zeid Ra’ad al-Hussein puts the warring parties on notice that under international law, they must distinguish between lawful military targets and civilians and civilian objects. The High Commissioner’s spokeswoman, Liz Throssell, tells VOA she does not know what the Syrian Government and allies hope to achieve by escalating the fighting. 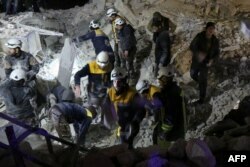 Syrian emergency personnel search for victims following an explosion at a base for Asian jihadists in a rebel-held area of the northwestern city of Idlib, Jan. 7, 2018. Zeid also expresses grave concern about the worsening situation in Idlib Governorate. Throssell says an estimated two million civilians are at risk of getting caught in clashes between Government forces, together with their allies, and an alliance of armed opposition groups. Under an agreement brokered by Iran, Russia and Turkey in May, both Eastern Ghouta and Idlib Governorate are considered so-called de-escalation areas. The aim of this pact is to quickly end violence and improve the humanitarian situation in the designated areas.